Announcement Welcome! I've been handcrafting books of all kinds since 1998 and I'm always happy to answer your questions. Five percent of my annual profits go to the Help Us Grow (H.U.G.) Reading Program here in Louisville. H.U.G. engages 2nd and 3rd grade students for an hour once a week with one-on-one tutoring in a large group setting. Their mission is to provide both character development activities and reading support to help struggling readers become more productive students in the classroom. I love having the opportunity to make a positive difference in children's lives with BOOKS! Welcome! I've been handcrafting books of all kinds since 1998 and I'm always happy to answer your questions. The book is amazing and Kris is even more amazing. She’s extremely thoughtful and works well with the customer. I’ll be buying from her again. NEW vegan and eco-friendly journals are available with both blank and lined pages! Made from cork leather, they have a soft feel and are extremely durable. Pen loop and magnetic clasp closure. NEW!! Hand-crafted leather wine tasting notebook with “vino” hot stamped on the cover. Space inside for tasting notes on 126 wines. Cheers! 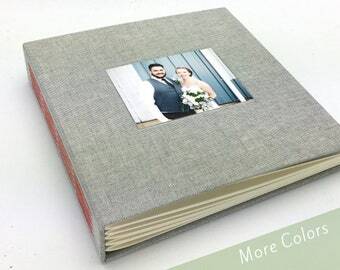 A wonderful choice for a wedding brag book or a parents gift! This elegant mini photo album with an ivory leather spine and beautiful Chiyogami paper covers features several options for a personalized title page. It also has a sleek magnetic closure! I’ve been a Maker as long as I remember. Long before it was a thing certainly. It all started when I was a young girl, building things with paper and tape and staples (and more tape and more staples to hear my grandmother tell it!). I made things out of Legos: cars, houses, and bowling alleys with ball returns. I probably should have become an architect, but that wasn’t to be. Fast forward to adulthood (I still find it hard to believe I’m in that category) and I find myself once again a maker, back to using paper – and lots of it – but no staples and very little tape. Over 20 years ago I found my passion: bookbinding. I get the pleasure of designing and building things every day. It’s visual and tactile and requires a lot of patience and attention to detail. The added bonus? I get to work with the nicest people and make something that brings joy or comfort. Over the past 20 years I’ve made books marking births and deaths and everything in between. I’m thankful for this opportunity to be a Maker. A piece of me goes into every book I create. I'm a lifelong West-Coaster currently enjoying an urban adventure in Historic Old Louisville, Kentucky. I see my environment as a mosaic of color, texture and pattern and hope this comes through in my work. Started at Scroll as a foot warmer in February 2012 and was quickly promoted to mischief-maker. Currently eats all discarded book board.